The shot of Genele in Sharpe's limousine in the current version of this season's main title (right screen capture) is from an unused version of the scene in # 214 (compare the left screen grab for the version used in that episode). Season time frame: This episode continues where # 215 left off because Danny and Michael come back to Sharpe's office early in the morning after they left it late at night at the end of # 215. Product placement: Jason Sampson mentions a Rolex watch. Fictional entity: Pickett Plaza, another investment project, is mentioned. Lighting mistake: One of the studio lights in the greenbeds above the interior set of Richard's house is in the wrong position. Strange reflections on DAVID SELBY are the result all through the scene with Richard and Jace. Lauren's new car is a red Ford van. The filming location for the La Serre restaurant in Tuscany is what used to be the actual restaurant by the same name on Ventura Boulevard in Studio City, CA. The restaurant closed in 1991; nowadays, the building houses The King's Head, also a restaurant. Inside joke: The character of Jovan Dmytryk, the chess champion of Yugoslavia, is named after MICHAEL DMYTRYK, the show's first assistant director. Jovan's suite at the Del Oro is basically the same interior set as the one used for Jane Callendar's room in Betsy's Motel in # 206, for Emma's Del Oro suite in # 207 and for Sydney and Ian's Falcon Crest Victorian Mansion guest bedroom in # 212 (see there). Only slight changes (repaint and new furniture as well as adding the same fireplace element that was in use for the season 8 Del Oro suite sets) were made for budgetary reasons. Richard buys Jace out for $ 250,000 although his interest in the firm is worth $ 2.5 million. Product placement: Sharpe mentions Tupperware, the kitchen supply company. 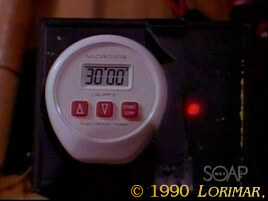 Product placement: The timer for Walker's time bomb is a model by the Micronta company. Fictional entity: Dynacorp is one of Sharpe's subsidiaries. Mistake: When Walker looks at the timer to check how much time he has left until the bomb goes off, it says 33 seconds. But the screen time does not match this time frame: 42 seconds will go by until the bomb really explodes. The original bible for season 9 planned for Walker to move away rather than dying.